A 2 following the KP indicates 2-pole operation. Example: KP2E250/56. A 4 following the KP indicates 4-pole operation. Example: KP4E250/56. All motors, whether permanent split capacitor or shaded pole, are UL/CSA Recognized and include automatic-reset thermal overload protection. 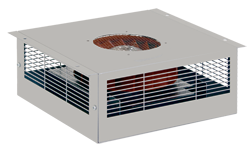 Designed for low temperature rise, Kooltronic motors are also cooled by the blowers' intake air, for maximum motor life. All motors are UL Recognized and carry a Declaration of Conformity to applicable CE Standards. Motors perform over a broad temperature range: -40°F (-40°C) to 158°F (70°C). Versatile Mounting: Mount on cabinet's top, side or even bottom. Specify model number. 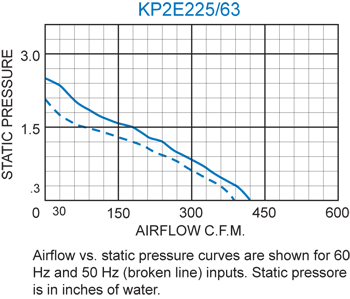 For 230 VAC operation, add a 2 after the K. Example: K2P2E225/63. (H x W x D)* CFM @0" S.P.